Warriors coach June Jones said from a work-atmosphere standpoint, this season has been his most enjoyable at UH. APPARENTLY you can derive a lot of enjoyment from a losing football season, even when you're the person most associated with it. 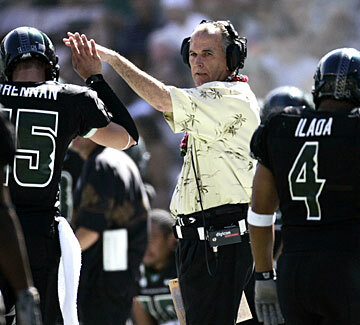 Just ask Hawaii coach June Jones, as the 4-7 Warriors prepare to complete their schedule Saturday against San Diego State at Aloha Stadium. "This has been the funnest year I've had coaching since I've been here," Jones said yesterday at his last weekly news conference of the season. More fun than the past four years, when UH went 36-17, including three bowl games? More fun than 1999, Jones' first season, when he took a team that went 0-12 to a 9-4 record? "I would say just from the work atmosphere, yeah," Jones said. Teaching new players the run-and-shoot offense and working with defensive coordinator Jerry Glanville, his former NFL boss, make it fun for Jones, he said. "I really enjoy watching some of these kids play," he said. "They get better every week. Jerry has been great to be around. In the workplace atmosphere, we are the same if we win or lose. It's been a great year." It could have been a good one in the standings, Jones said, with better defensive and special teams play. "If we were the 50th-rated defense, we'd be good enough to be nine wins right now," Jones said. "But because we're not where we would like to be in all phases, special teams and defense, our offense isn't good enough to carry us." Expectations and pressure were lower this season because the Warriors had to replace nine starters and key reserves on offense. "It's frustrating because you lose," Jones said. "But I enjoy the kids and I enjoy watching them get better. (Quarterback Colt Brennan) did some unbelievable things. I don't think Fran Tarkenton could do those things." Bess should play: Freshman slotback Davone Bess will probably be healthy enough to play Saturday, Jones said. Bess left the game against Wisconsin last Friday with a hip pointer. "He's OK, he was running around today," Jones said. "It's pretty sore, but he can run so I don't anticipate a problem." Defensive end Mel Purcell is also expected to play. He did not start against Wisconsin because of an elbow injury from the Utah State game two weeks prior. Cornerback Turmarian Moreland will probably be out with a knee sprain, also suffered against Utah State. "I talked to him at the (Wisconsin) game and he said he's jogging, but it feels loose," Jones said. "So I would anticipate that he won't play." 3-4 or 4-3? : A hot topic lately has been UH's switch to a 3-4 base defense from a 4-3 in previous years. The 3-4 drew criticism after Wisconsin rushed for 249 yards Friday. Jones' answer is that the Warriors often re-align into a four-man front depending on down and distance and the offense's tendencies. "It's the same basic package and the same people are playing it," he said. "We played actually more four-down. I would say we're 85 percent. The few times we were in 3-4, we quickly went to four front."